"Honestly, we expected to jump all over them early. Just take care of business," said Lake Oswego junior wide receiver Casey Filkins, who carried seven times for 78 yards and three touchdowns." "Yeah, everything went according to plan," said Lake Oswego coach Steve Coury. "We pulled our guys out really early because they're really banged up and hurt (and) it was an opportunity for a lot of our kids to play, which was great." With the win — the Lakers' third straight — Lake Oswego improved 3-0 in the Three Rivers League (tying it with Tigard in the TRL championship race) and to 6-1 overall. With the loss, Canby fell to 0-4 in the TRL and 0-7 overall. The game could not have started any worse for Canby, or any better for Lake Oswego. On the opening kickoff from Canby senior Rizdin Miller, Lake Oswego senior Matthew Sebolsky returned the ball 80 yards for a touchdown just 14 seconds into the game, though a missed extra point kept the Laker lead at 6-0. Canby got the ball back and put together a strong opening series, moving into Lake Oswego territory before Canby quarterback Trent Wakefield was picked off by Laker senior Chris Todd. Todd returned the ball 54 yards to the Canby 8, and from there, Lake Oswego punched the ball in on the next play, with junior Casey Filkins running up the middle with 9:11 remaining in the first quarter. After the PAT, Lake Oswego led Canby 13-0 — that with only 8 yards coming from the offensive unit. Canby was held to a three-and-out on its ensuing drive and Lake Oswego got right back to work. Taking over at the Canby 48-yard line, the Lakers put together a seven-play drive, and once again, it was Filkins with the scoring play. Filkins went up the middle again to score, this time from one yard out, with 2:45 to go in the first quarter. Another missed PAT left the lead at 19-0 for the Lakers. Unfortunately for Canby, Filkins and the Lakers offense weren't done. The next Lake Oswego possession only lasted only four plays, and once again, Filkins punched it up the middle from 15 yards away. The extra point was good, and Canby found itself in the hole 26-0 just 43 seconds into the second quarter. The final Lake Oswego points of the half, and ultimately the game, came with 6:23 left in the second quarter. After a nine play, 54-yard drive, senior quarterback Jackson Laurent hit junior tight end Marshall McGuire for a 2-yard touchdown and a 33-0 lead. Canby did not let itself get shut out at home though. In the last drive of the half, Canby moved down the field in 2:08 and scored its first touchdown when junior quarterback Andrew Peters connected with junior receiver Ronan Gay for a 5-yard score. The ensuing PAT was blocked and Canby went into the locker room trailing 33-6. In the second half, Peters did it again when he threw a 72-yard touchdown pass to sophomore Tyler Mead who ran up the left-hand side of the field for the team's second touchdown with 6:49 to go in the fourth quarter for the final 33-12 margin. "We practiced all week with a focus on getting better, and it took care of itself," Filkins said. "We were glad it went that way because we wanted a lot of kids to play tonight, so that was good." "I was proud of our kids' mental approach because sometimes you get a team that's struggling and you play them and let yourselves down," Coury added. "Our kids didn't do that all week. I think we got better during the practices and that's always the goal." 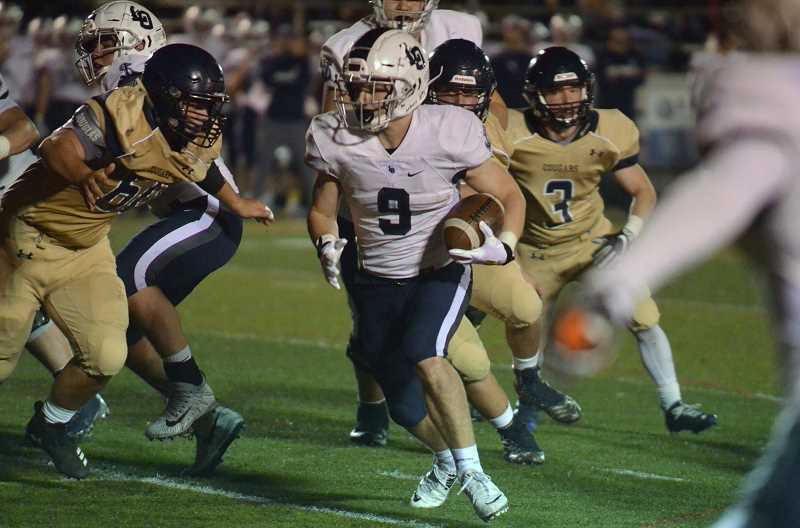 For the game, Lake Oswego's Connor Willihnganz ran 11 times for 48 yards, Laurent hit on 7 of 9 throws for 103 yards and one TD, with Emmet Daly catching three passes for 46 yards. Jonas Hunter also made an interception for the Lakers. For Canby, Steven Dale carried nine times for 37 yards, Wakefield went 17 for 25 passing with two TDs and two interceptions for 141 yards, and Mead made three catches for 104 yards. Next up, Lake Oswego will play at Tualatin (1-1 in TRL play, 6-1 overall) at 7 p.m. Friday, while Canby plays at Oregon City (0-3 in TRL play, 3-4) at 7 p.m. Friday.